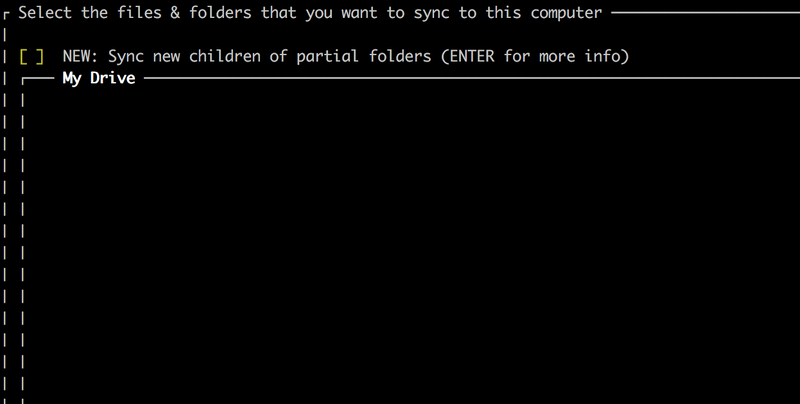 I’m using insync headless (my box doesn’t have window manager), but can’t figure out how to select a subset of folders to sync. When I first set it up, it started syncing dumping GB’s from my gdrive onto the NFS sync folder I setup. I want to sync just one folder from my gdrive. 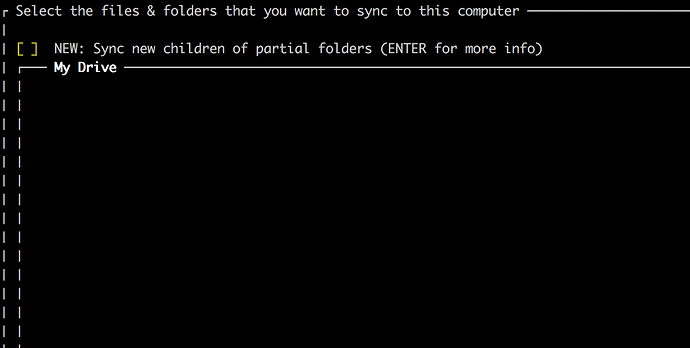 This is also available through Insync’s man page: man insync-headless. In your case please try running the command while passing the email address of the account you added to Insync as an argument. That help string just says “Manage selective sync settings of account through a curses interface” and doesn’t specify how to use the command. Where are the arguments documented? @Yaroslav_Bulatov: The EMAIL part after “insync-headless manage_selective_sync” means that you need to pass the email address of the account you added to Insync as an argument. So if for example your email address is test@mail.com, the form of the command should be insync-headless manage_selective_sync test@mail.com. Apologies if this was unclear. Insync please start to post clear info to us noobs, we are having to read between the lines all of the time. Above are you talking about my synchronised account email address or the shared persons email address. It is ambiguous. YES, where are the arguments documented? OK so we use an email address, who’s email. and if I use the email of the person sharing with me, it does nothing! This subject needs to be better documented. sharer@sharersdomain.com has not been added to Insync. Which fills me with no joy. For the arguments, you may take a look at the docs shown when running man insync-headless. As for the second, you need to run insync-headless accept_all_new_shares [your email], not the sharer’s. Thank you for your honest feedback; we appreciate it and it helps us determine how we can improve on our product and support. Please let me know if you have any other questions! So You never improved on this documentation. Why do we, as your customer, continue to help you realise your faults when you are not willing to improve. We just need reasonable documentation!